These lovely wafer paper butterflies are from the Etsy seller IncrEDIBLE toppers. The butterflies come pre-cut, stacked and vacuum sealed for freshness. I was definitely satisfied with this purchase and wouldn't hesitate to reorder. 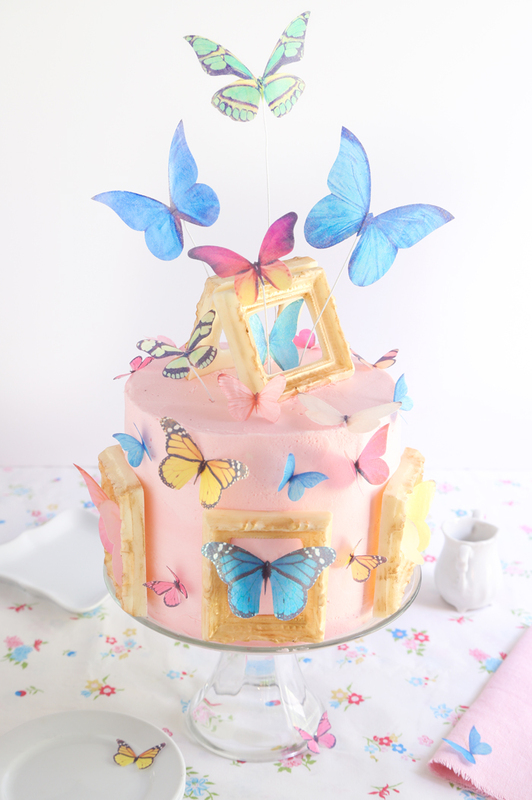 Another part of the inspiration for this cake came from the framed butterflies on my living room wall. I have many different butterfly genus framed, which admittedly, might seem a little strange to have something that has expired as room decor (I chalk it up to eccentricity). I found an ornate frame chocolate mold that perfectly fit my butterfly gallery idea. I made some white chocolate frames and dry brushed them with old gold confectionery dust. 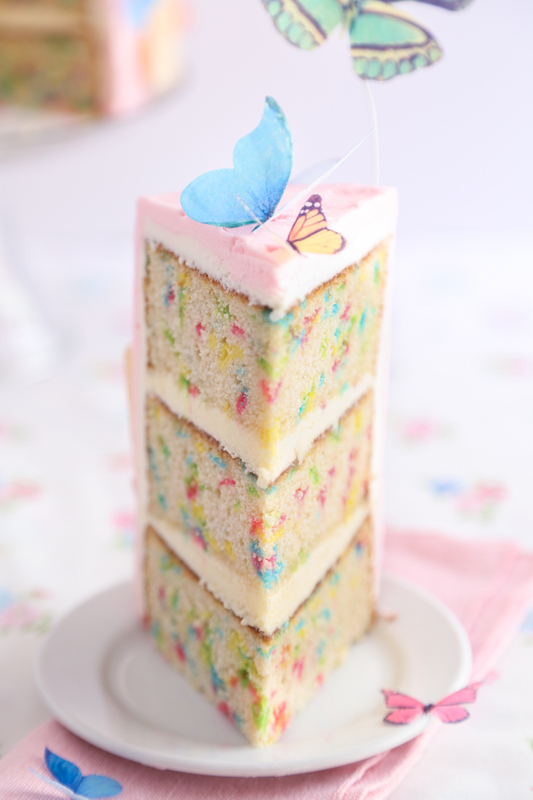 I used butterfly confetti quins to create pastel speckled cake layers. You can find them for purchase here. Although they lose their butterfly shape during baking, I sort of love knowing the interior is also filled with butterflies. 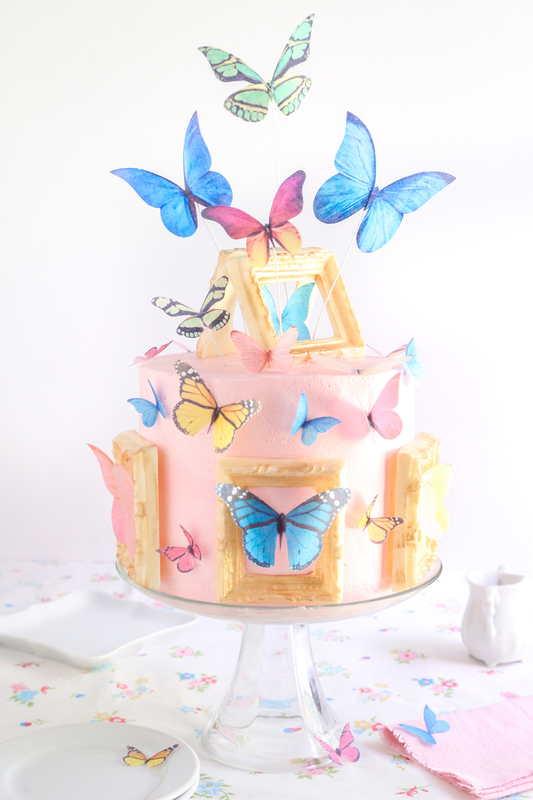 I propped two of the gilded white chocolate frames against each other on top of the cake and arranged butterflies on wire so they looked as if they were flying out of their frames. It's almost a message. I'll let you interpret that however you wish. 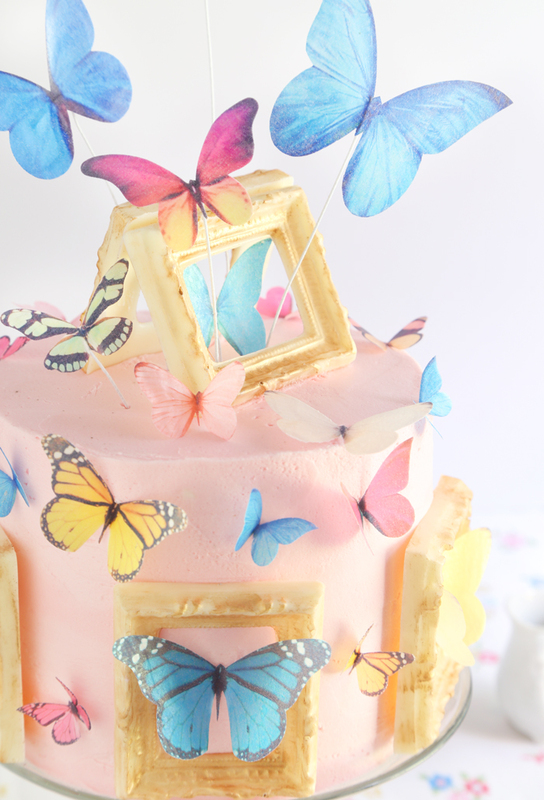 The butterflies are attached to cloth-covered stem wire and inserted into the top of the cake to create the effect of ascent. You can attach the butterflies to the wire with corn syrup, but they'll need lots of time to dry so they stay put. If you're in a hurry, and you don't plan to eat the butterflies, then a tiny piece of cellophane tape will hold them to the wire securely. It's best if you place the chocolate frames around the bottom edge of the cake where the cake stand can help support their weight. 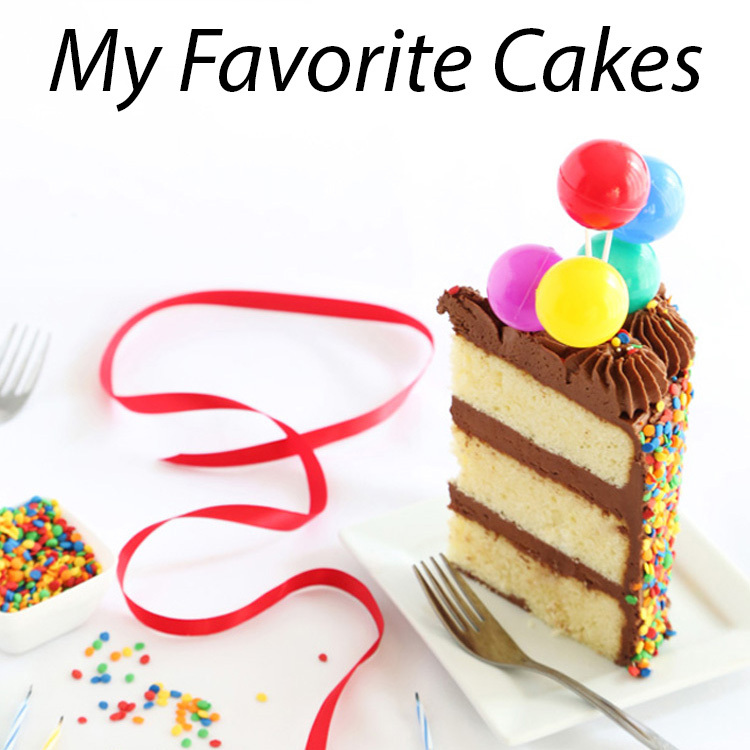 I tried placing them in the center of the cake but they were slowly sliding south. I really like how the cake turned out overall, though. The frames at the bottom almost give this cake a two-tier look. The butterflies couldn't be easier to attach to the sides of the cake. You'll bend them slightly at the center so they have dimension, then stick them on the icing. It's that easy! The confetti sponge is white cake flavored with vanilla extract, and I opted for lemon buttercream for the filling and frosting. I've been calling this Pink Lemonade Confetti Cake, but its flavor could be endlessly varied to your liking with clear extracts (orange, coconut, almond, etc.). I really enjoyed making this cake, and the decorating is easy enough for novices! I hope you'll give it a try. 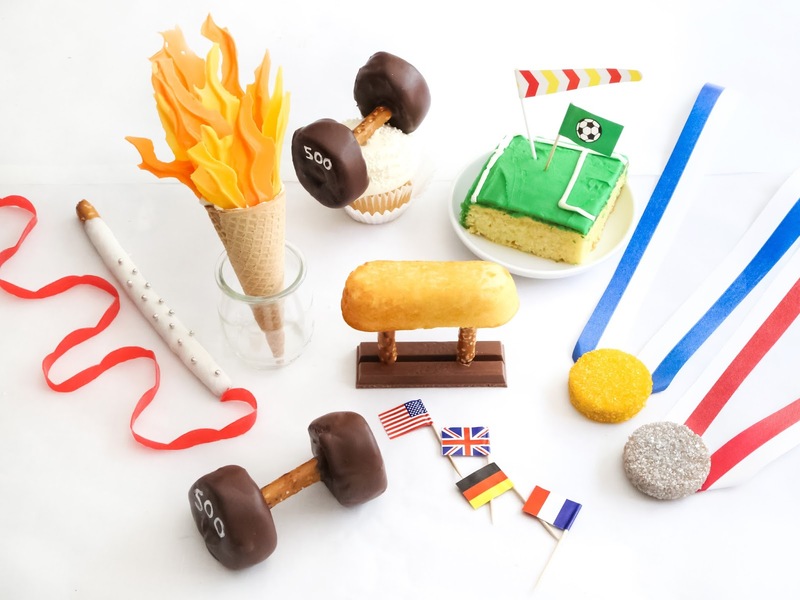 Edit: I almost forgot to mention that I created some super cute, super approachable summer Olympics-themed treats for Food Network - you can check them out here! Headnote: Sources for the wafer paper butterflies, chocolate frame molds and cloth-covered wire can be found in the blog post. To make the white chocolate frames, melt 16 ounces of white chocolate and pour into the mold cavities; place molds in the freezer until firm and pop them out on a piece of parchment paper. Let the frames come to room temperature before dry brushing with gold luster dust. 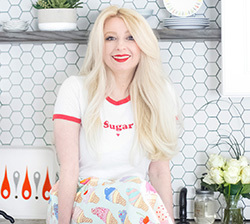 Make the confetti cake: Preheat oven to 350 degrees. Grease three 6x3-inch springform pans and line with parchment, or spray with flour-based baking spray. Add flour mixture alternately with the egg white/milk mixture. Begin and end with flour mixture and beat until smooth on medium-low speed after each addition. 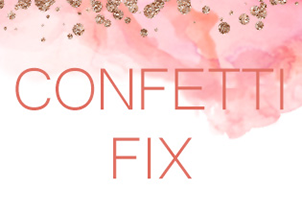 Fold in the confetti quins. Divide batter between pans. 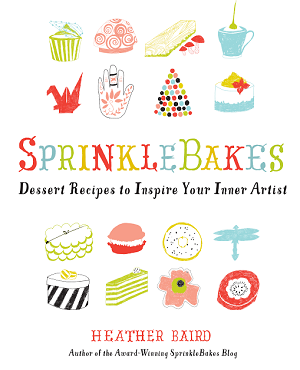 Bake 6-inch cake at 350 for 30-40 minutes, or until the cakes spring back when pressed in the centers. Let cool slightly in pan, then turn out and cool completely. 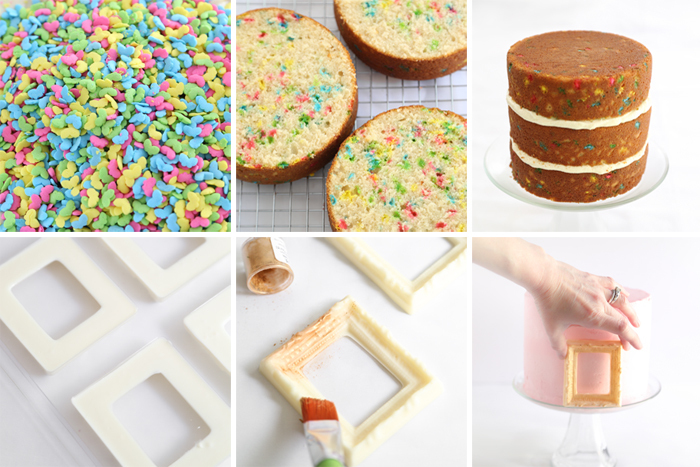 Level the cakes using a cake leveler or large serrated knife. Make the lemon buttercream: In a stand mixer fitted with the whisk attachment, mix together the butter and confectioners’ sugar. Begin on low speed until crumbly, and then increase to high and beat for 3 minutes. Add lemon extract and beat again for another minute. If you find the buttercream is too stiff, you may add milk or heavy cream 1 tablespoon at a time until the mixture is spreading consistency. 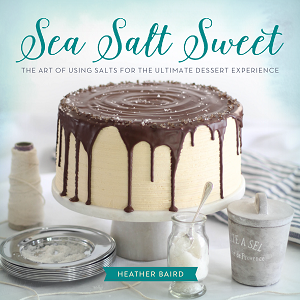 Fill the cake layers with about 1/3 to 1/2 cup each of white lemon buttercream, and stack them on a cake stand. Add pink food color to the remaining buttercream and whip until a pastel pink color is achieved. Frost the exterior of the cake with a crumb coat of pink buttercream; refrigerate until firm, about 1 hour. Generously frost the chilled cake with the remaining buttercream. Use an offset spatula warmed in hot water and wiped free of moisture to perfectly smooth the outer coating of buttercream. Decorate! While the frosting is still tacky, place the chocolate frames onto the buttercream, evenly spaced along the bottom edge of the cake stand. Place a large wafer paper butterfly in the centers of each frame. Place two frames propped against each other on top of the cake. Attach butterflies to cloth stem wire using a small amount of cellophane tape on their backs, or use a dot of corn syrup to attach them tp the wire(extended drying time is needed for the corn syrup method; consider making the butterfly stems a day ahead of time). 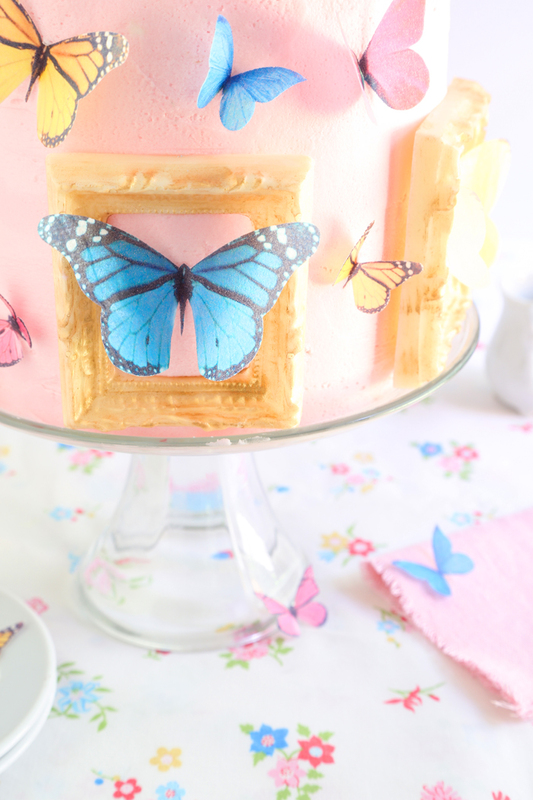 Wrap the stems with a small amount of plastic wrap and then insert them into the cake upright, so that the butterflies appear to be flying out of the chocolate frames. 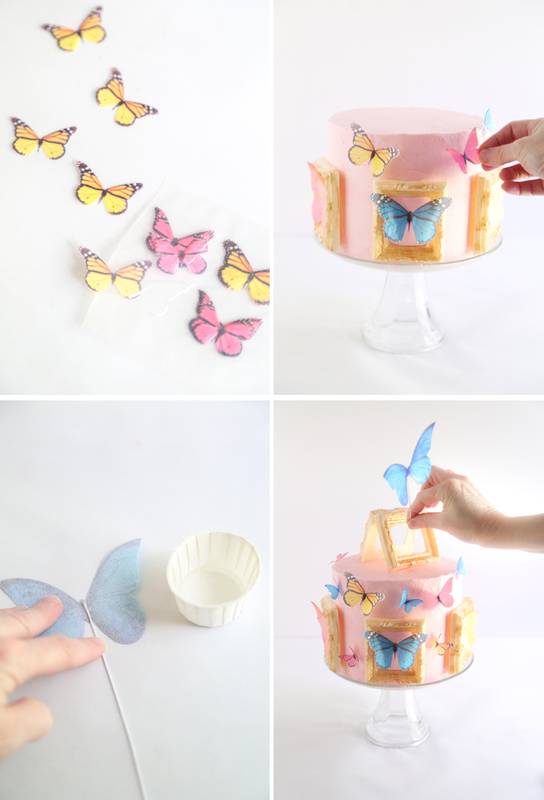 Randomly place the remaining wafer paper butterflies on the cake by folding them in half gently and gently pushing them into the buttercream. Store the cake loosely covered in plastic wrap at room temperature. Important! Moisture is the enemy of wafer paper. It will break down if refrigerated. The frames definitely give it a tier effect. In fact, when you said that, I had to scroll back up to check the picture because I already thought it was two-tiered! This is a truly lovely cake. The cake is gorgeous inside, beautiful. This cake is really a work of art. So beautiful! I love the chocolate frames. I was so happy to see this, I've used your cakes as inspiration for my older daughters first two birthdays and was just looking for something special for my seconds first birthday. This is perfect. You do such beautiful work. I love your blog so much!